Each Road Warrior combines one of our patented Smart Cables with just about every conceivable serial port adapter, packaged in a convenient leather case. 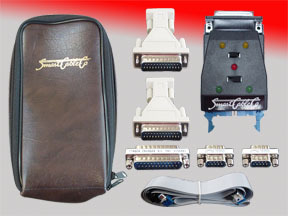 The Road Warrior Kits help the end user connect to any RS232 device. Technicians like the flexibility of the Road Warrior Kits because when they are visiting a customer site, they can easily communicate with any RS232 connector.